We spent hours verifying there were no conflicting SSL's before contacting Gina. Initially, she genuinely tried to help. The SSL worked for some SANs but not all, with SSL testing sites (even GoDaddy's) saying there was an OCSP error for two SANs. She transferred us to Henry who refused a refund and refused to get the UCC certificate working citing installation, which was on a GoDaddy Server. If it was an installation error, none of the SANs would work, barring conflicting certificates, which we had made sure there were none. This came on the heals of their server people putting a line in the .htaccess file redirecting all .jpg, .png. 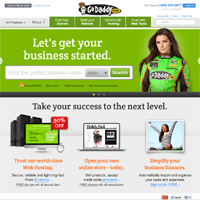 .gif files over to a GoDaddy sales site. These people might be cost-effective for domain sales but for hosting and secure certificates, it's hit or miss and you don't really want to be on the "miss" side of things. I'd stay well clear of GoDaddy hosting and SSL's.